AP Inter First 1st Year 2019 Exams Time Table Download- Andhra Pradesh Junior Inter Examination Schedule 2019 Download available from bieap.gov.in website. The AP Senior and Junior Intermediate 1st year Examinations tentative schedule starts from 27th February 2019 and end on 16th March 2019 and 2nd Year exams from 28th February 2019 to 18th March 2019. Practical Examinations to be conducting from 1st February 2019 to 20th February 2019. 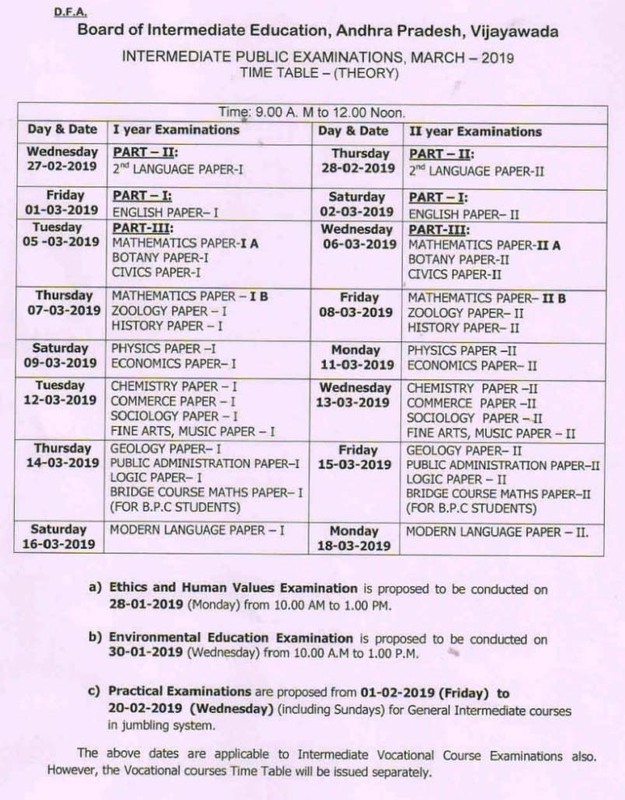 5th March 2019 PART-III: MATHEMATICS PAPER-IA, BOTANY PAPER-I, CIVICS PAPER-I.